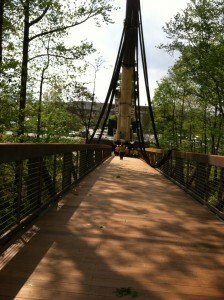 The new pedestrian bridge was lowered into place by a large crane at Cato Campus on Saturday, April 26. The crane, which required 11 tractor trailer loads to be delivered to the campus, was assembled at Cato over the course of April 23 and 24. The bridge now spans a wooded ravine, linking a new parking area to the main part of campus. Assembling the bridge on site and lowering it into place using the large crane ensured the woods and small stream that flows through the ravine was undisturbed as much as possible. At its mid-point, the bridge will be about 12 feet above the ground. The new parking area and pedestrian bridge were needed as the Cato Campus adds a new 85,000-square-foot academic building. The building will sit in a location that currently provides student and employee parking. In addition to providing much needed classroom space, the new facility will include space for a new library, auditorium and more student lounge and study space. CPCC will break ground for the new building within the next few weeks. January 2016 is the targeted completion date. The new facility will provide critically needed space at the Cato Campus, CPCC’s most cramped campus. Cato currently serves approximately 12,000 students, with 135 employees.